So, I finished another sock and started on the second. These are the Go With The Flow socks from Favorite Socks (yes, another pair from that book), and the pattern is really simple and relaxing to knit. They're excellent knitting-in-class socks, since they require basically no attention to detail. I really like this yarn - it has a similar twist and sheen to Koigu, but is a completely solid, bright color. I bought it right before I went on vacation with my friend Ben and his family last year... I knitted almost the entire cuff of the Uptown Boot Socks, got scared of yardage issues, and ripped it out. I think I might have actually brought it with me when Ben, his sisters, his stepdad and I went floating down the river on rubber rafts, when my knees got so sunburned that they stung for a week. Although I don't think I would be able to forgive myself if I dropped any of my yarn into a river. Anyways, I'm slowly chipping away at all of the projects I have left to do. My roommate is out of town until Sunday, so I suspect that I will be knitting in the library a lot this weekend. 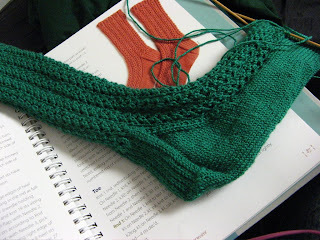 It only took me 5 days to finish the first sock, so I'm hoping that the second one will go fast, too! In other news, Calculus is not my friend. We're working on Sequences and Series, which is making my brain hurt with all of the infinite limits and rules, summations and all of that crap. I've started getting my classes lined up for next semester, and I'm really excited because I'm probably going to take Organic Chem, Japanese 101, and one humanities class to be determined. And, if it works out, I will be co-teaching a knitting Exco. Gah... I'm off to knit my socks, write a presentation, and beat my head against some Sequences and Series homework. Woo. Thanks for appreciating my Bears on Swings! They're a hit on campus. 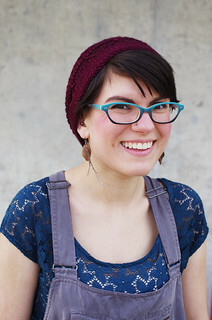 It's good to "meet" another chemistry student/knitter. I'm graduating with my degree in chemistry in a few weeks. Science and fiber art! Love the color of those socks! I have that book, but I haven't gotten around to making any of the socks from it yet. Thank you for the comment on my blog - now I'll be sure to read yours as well! Spring in Ohio at last!